Manure pit-related explosions or flash fires have occurred recently in both Minnesota and Iowa livestock buildings. Luckily, the explosions, to date, have mainly resulted in building damage, with few animal losses and no personal injuries or fatalities reported. According to police officials, the owner of the hog farm, Scott Mashing, was stirring the manure pit and standing near his tractor when the explosion occurred … The blast was so intense that it catapulted the man 40 feet into the air, across the yard, and into a gravel road. Mashing sustained burns and some singed hair. No pigs were apparently hurt in the explosion. It is unknown if Mashing was transported to an area hospital for treatment of his burns. The building sustained nearly $500,000 worth of damage. Foaming of manure pits is a growing and significant concern that may be related to the explosion incidents. Some of the recent cases have reported “foaming” or extensive bubbling on the manure surface prior to the explosions. Some reports noted that several feet of foam can develop in a matter of days. Some manure pits will foam while others do not. Experts are working on food additives and such to control foaming. But at least explosions are highly visible and, it seems, not that deadly. There are some terrible stories about farmers going down into their pits to fix a broken agitator and keeling over when they inhale the poison gases. Then the dad goes in to save his son and also collapses and then the second son goes in… There are a couple cases like that where four or five people are killed. 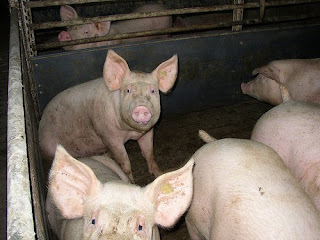 Industrial hog farmers are much more likely to have impaired lung function, they are on the front lines of zoonotic diseases. It’s hard, dirty work. Most farmers I’ve talked to said they’d gladly adopt cleaner, safer forms of farming if consumers would pay for it. But that doesn’t seem likely. Countries that have passed laws requiring more humane farms (like Sweden) end up simply importing most of their pork from other countries with fewer regulations. So the least you can do when you bite into your holiday ham is think of the intrepid farmers who brought it to you.